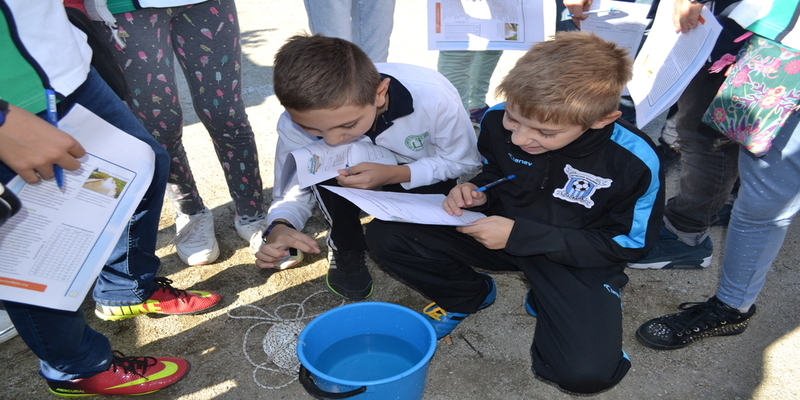 Guest post submitted by Misoslava M.
World Water Monitoring Day was recognized in Bulgaria by the East Aegean River Basin Directorate (EARBD), thirty students from the innovative class of "St. Patriarch Evtimii" – Plovdiv and their teachers. Participants met on the South Maritsa bank, near the bridge of the Water Palace in the town of Plovdiv where a thematic talk was held and a demonstration of sampling and monitoring the water from the river was carried out. What is monitoring? What is water monitoring? Why do we need to monitor the state of the water? How can we purify the water to make it fit for drinking? These and many other issues raised by the young nature lovers were answered by the experts of the EARBD. The student participants filled a bucket of water, and measured the temperature of the air and the water, the dissolved oxygen, its pH and its turbidity. They handled the data carefully in the specially prepared information sheets and this made them feel like real researchers. For the shown responsible attitude towards the water resources, all students received certificates from the Director of EARBD. Want to share your #MonitorWater story? Tell us how you're taking action with the EarthEcho Water Challenge and we’ll highlight your efforts.